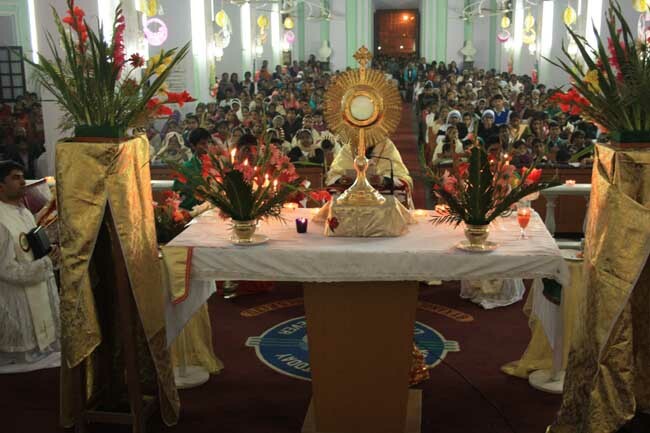 The Archdiocese of Agra organized on a grand scale the celebration of the Solemnity of Christ the King that marks the end of the liturgical year and the conclusion of the Year of Faith at the Archdiocesan Headquarters. This year the twin celebrations were also significant for the fact that it would be a pilgrim event for the entire diocese. Responding to the call of the Archbishop to make it an Archdiocesan Day of Pilgrimage, pilgrims from all the parishes and mission stations of the Archdiocese flocked to the Cathedral Campus from 12 noon. The spiritual activities were spread over the entire Cathedral Campus. While the pilgrims were engaged in silent adoration of the Eucharistic Lord at the in the Cathedral Church, Praise and Worship sessions were going on at the open stage of St. Peter’s College. Arrangements were made for the pilgrims to make their Confession in the Church of Pieta (the historical Akbari Girja). The Holy Eucharist of the Solemnity of Christ the King began at 4 p.m. at the open stage of St. Peter’s College. 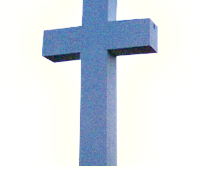 The Archbishop Most Rev. Albert D’Souza was the Main Celebrant along with more than 50 concelebrants and around two thousand lay faithful. The Mass was immediately followed by the Solemn Eucharistic Procession. The Holy Eucharist was solemnly carried along the decorated pavements of the Lower and Upper Padri Tola and entered back into the Cathedral Church. There were two brief halts for benediction and at one place there was the reading of the Gospel followed by a brief Homily. Back in the Cathedral Church there was the solemn recitation of the Litany to the Sacred Hear of Jesus and the Prayer of Consecration to the Sacred Heart of Jesus. The Archbishop then imparted the Solemn Eucharistic Blessing to all gathered. The Eucharistic Procession is an annual event in the Archdiocese on the Solemnity of Corpus Christi and is a solemn and prayerful expression of our faith in Christ the King to the world outside that know little about him. While we are called to witness to Christ in our day today life, it is also important that we witness to him as a believing community that professes his love and forgiveness in public. Earlier, on 13-14 October, the Archdiocese hosted the Regional Faith Festival. It was an event that witnessed a mammoth crowd of the lay and religious faithful. Bishops, Priests and Religious from the twelve dioceses of the Agra Ecclesiastical Region gathered at Agra for two days to celebrate what was called the Festival of Faith. The first day of the Faith Festival was a day of community prayer, talks on faith, personal witnessing of faith and life, skits and dances based on the theme faith etc. The faithful were extremely enthusiastic as they were attending this great event in the presence of their own bishops. The second day of the Regional Faith Festival witnessed an overjoyed and enthusiastic crowd as His Excellency Salvatore Pennacchio, the Apostolic Nuncio to India made his historic visit to Agra and the Regional event. He was accorded a warm welcome by the Archbishop, bishops, Provincial Superiors, Priest, Sisters and the lay faithful. The Nuncio spent the entire day with the people, Presiding over the Eucharist and attending the sessions and the faith enriching spiritual sharing. His Excellency Salvatore Pennacchio was all praise for the depth of faith that was manifested and the longing in people for an increase of faith. The entire festival of faith was desire of the Regional Bishops’ Conference and the wholehearted support of each and every bishop in the region made it a reality.